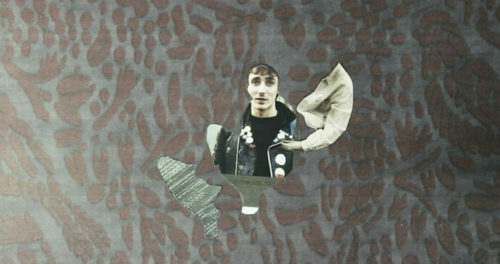 Hi, I’m Matthew Kennedy, an artist/filmmaker from Glasgow, Scotland. I’m pleased to be writing my first blog post for Disability Arts Online about how Oska Bright Film Festival has given me a platform as a queer learning disabled filmmaker and how I’ve come to appreciate and love what the film festival has done in terms of giving me a voice. 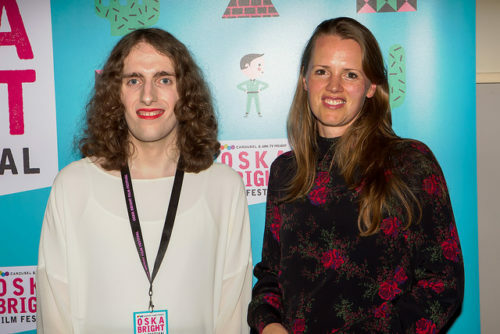 In Spring 2015 I was looking up film festivals online to submit my short film ‘Just Me’ and found Oska Bright. I immediately thought about the values that the festival held; its commitment on putting the learning disability filmmaking community front and centre within the festival is definitely made me pay attention. In August I heard that ‘Just Me’ had been chosen to screen at Oska Bright that year. I was beyond excited. This would be my first physical trip outside of Scotland as a filmmaker and I knew it was going to be an important one in terms of making connections and trying to find some form of community. My first visit to the festival was definitely an enriching and informative experience. Actor Sarah Gordy gave the Keynote speech. She spoke about being an actor with a learning disability and that only 0.3% of the disability community work within the creative sector. She ended saying ‘we need our voices to be heard’ which set the tone for the rest of the festival. On a personal note my meeting with Oska Bright’s Matthew Hellett (also a filmmaker), being able to spend time and exchange questions, made me realise we were both part of the LGBTQ+ & Learning Disability communities and that we were no longer left feeling alone or isolated, that we could open up a dialogue with each other which we have done with the help of Oska Bright. home thinking of how grateful I was to have been there; to know that a film festival within the UK is making things possible for me and other learning disabled filmmakers. In the summer of 2017 I got the news that my short film ‘Versions’ would be screening at the festival that year. I was also informed that a new LGBTQ+ strand would be taking place at the festival created by Matthew Hellett, now the festival’s head programmer. I was invited to do the keynote following the LGBTQ+ strand which I gladly accepted. I began by speaking about how I got a tiny camcorder for £21 from Toys ‘R’ Us to make my first two short films. I also spoke about queerness, femme identity and being learning disabled in regards to my films ‘What Is Femme Anyway’ and ‘Just Me’. It was important for me to bring the subject of archives and history into the speech because it’s something that rarely gets talked about within the learning disability arts community. I ended the talk by saying that I was only one piece of the jigsaw puzzle, that as for the future the conversation around LGBTQ+ learning disability representation within filmmaking is just getting started, that we are not going away anytime soon. On the night of the awards ceremony I was presented with the ‘Outstanding Contribution to Cinema’ award by filmmaker Debs Paterson. That night I didn’t have the time to really process what the award itself meant to me. Looking back now it signified to me recognition for the work I’ve done so far by a film festival that brings me so much excitement as a filmmaker. I’ve been to two editions of the festival within the last four years now. Reflecting back I’ve felt a massive shift in terms of personal growth. The festival itself is having its own form of personal growth too. They’ve put out a submissions call out for LGBTQ+, BAME & Women filmmakers for this year’s festival. This to me shows that the festival is keen to listen to other narratives and open up the subject of representation even further. Oska Bright Film Festival to me is one of the most important film festivals within the film festival circuit. It’s the 9th edition this year and it’s thanks to those filmmakers who helped create the festival that we’ve had 15 years of learning disability film. Oska Bright is helping to contribute to a filmmaking culture that is rightfully ours; we’re here and we’re visible. If you have a film you’d like to enter into the Oska Bright festival, please visit the website: https://oskabright.org/submit-your-film/ or FilmFreeway: https://filmfreeway.com/OskaBright – it’s free to enter. The deadline is 30 March 2019.